Bill Gates doesn't pretend he lives in an egalitarian household. When it comes to parenting his three children, the billionaire Microsoft mogul readily admits his wife Melinda has done more than her share of the work raising the kids. "My wife does 80%," Gates told a crowd of Harvard students last Thursday. Gates spent two years there taking math and computer science courses as a pre-law student, but never finished up his degree (though he was later gifted an honorary diploma from the Ivy League university). "My eldest graduates from Stanford in June, so I'm optimistic she won't fall into my footsteps," Gates joked. 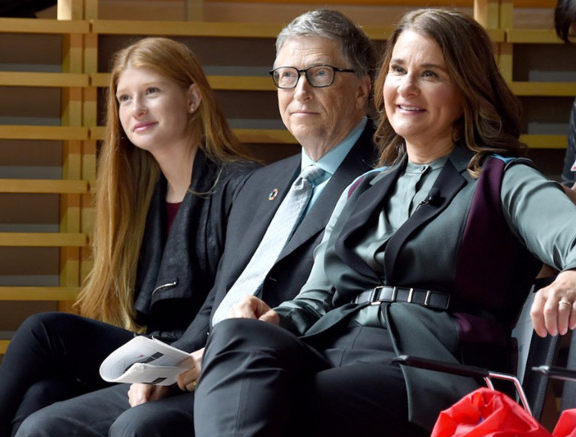 Gates said he and his wife have been quite deliberate about the model they've used to raise their three children, who are now 15, 18, and 22 years old. He says the couple followed a 1970s "Love and Logic" parenting model. It's a formula that was created by a group of three men — a mix of psychologists, psychiatrists and former school administrators. The core idea of their philosophy is centered on the idea that exerting emotional control, essentially minimizing emotional reactions like shouting or reprimanding kids. "One of the greatest benefits of applying Love and Logic is that it helps us learn how to keep a tighter leash on our emotions and on our tongues," co-founder Charles Fay wrote in a blog post about his model. "Can you get rid of the emotion? You can't totally do it," he said. Aside from reining in hot-blooded parent tempers, the love and logic model also stresses the importance of not leaning into rewards for kids, but instead demonstrating unconditional love and admiring kids for who they are, not what they do (or don't) achieve, like a poor test score or a bad grade. "Many highly successful people struggled with grades as children," Fay wrote on his site. "What's most important is that our children develop good character, curiosity, and problem-solving skills." The model is a bit like the Socratic method, in that it pushes parents to focus on asking questions of their kids and getting them to think about how to solve their own problems, instead of feeding them answers. Gates says the "Love and Logic" method is a far cry from the way he grew up, but he knew he wanted to do things differently with his own kids. It wasn't the only way he set boundaries for his children while they were growing up. None of his kids owned a cell phone until they were 14 years old. The children also attended Catholic church regularly with their parents. And they will each get about $10 million of their parents fortune as inheritance, a mere fraction of the mogul's roughly $90 billion net worth. "We want to strike a balance where they have the freedom to do anything, but not a lot of money showered on them so they could go out and do nothing," Gates once told TED.